Way up in the North Woods, twin moose babies, Alfonse and Abercrombie, are born. When they grow antlers, they strike out on their own. Soon Abercrombie is captured by two men who take him to Central Park Zoo in New York City. Alfonse escapes but falls through the ice of a frozen lake and turns blue. With the aid of a little yellow bird and advice from an owl, he sets off on his journey to rescue his brother, guided only by the North Star at his back. His quest includes many hilarious encounters in which he comes to the rescue using his antlers and receives medals for his efforts. When he arrives at the zoo he finds that his brother prefers peanuts and popcorn to the acorns of the North Woods and refuses to go back. What will Alfonse do? He wants to be near his brother. He wants to find his beloved yellow bird. 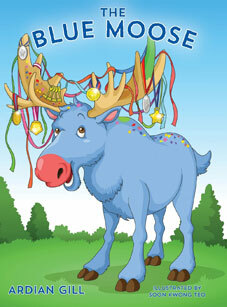 Join the intrepid blue moose and be charmed by a story guaranteed to delight readers of all ages. Once upon a time, way up in the North Woods, two little moose babies were born. The two brothers played together and slept together and never left each other’s side. If one wanted to sleep, the other would sleep next to him. If one wanted to run through the woods and play, the other would run with him. This was fine with Mr. and Mrs. Moose, because if they called one the other would come too. The trouble was, if they only wanted one little moose to come, they couldn’t do it. “Well, I’m only up to the letter A,” said Mr. Moose.“So we’ll have to give them names starting with the letter A.” He thought and thought. “Archie and Albert,” he suggested. 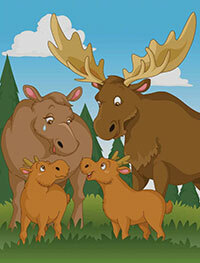 “Perfect,” said Mrs. Moose, and from that day on the little moose twins were called Alfonse and Abercrombie. The trouble was, the twins looked so much alike that the parents were never sure whether when they called Alfonse, Abercrombie came, or the other way around. So they just called “Alfonse, Abercrombie,” and both twins came, just as before. But their father said, “Come on now, boys. I’ll show you where the acorns hide.” Well, that sounded like a fun game of hide-and-seek, so the boys bounded off after their father, who took them a long, long way through the woods until they came to a big oak tree in a clearing at the edge of a lake. He snuffled in the leaves and came up with a mouthful of acorns and began to chew them. The boys just stood there watched. “Well,” said their father,“you may do as you like, but if you want to be on your own, you’ll have to learn to like acorns. That’s just about all there is to eat in the winter,” and he walked off into the forest, leaving the two brothers staring after him. Abercrombie didn’t answer right away because he was trying hard not to cry. Finally he said, sniffling, “No. We’re big mooses now and we’re on our own.” Then he said, “I’m hungry. I’m not going to eat any old acorns, though. I’m not a squirrel,” and he gave a little sob. Alfonse began to cry too. Then he said,“But we have to eat something. I’m going to try just one.” And he stuck his nose down into the leaves until he found a pile of acorns. “ They don’t smell too bad,” he said and slurped one into his mouth. As he began to chew he stopped crying, and a big smile lit up his face. “ These are delicious,” he said and stuck his nose into the pile and began to chew. The brothers stopped fighting and tried to run, but they found they had locked antlers. They began to pull at one another.“Let go,” Alfonse yelled. “You let go,” shouted Abercrombie, and they tugged at one another until finally, with a twist of his head, Abercrombie tore loose and ran. He ran right into a net the hunters had spread. He had never felt anything like it. The more he struggled, the tighter the net became, until he couldn’t move at all, and just sat and cried. When twin moose brothers set out to explore the world, they never thought they would end up being separated. Alfonse and Abercrombie get split up when Abercrombie is taken by two men to the Central Park Zoo in New York City. 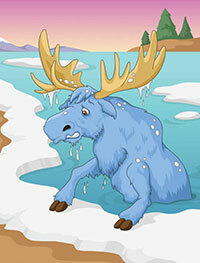 Alfonse escapes but falls into trouble as he goes under the ice of a frozen lake and he turns blue from the cold. But some unlikely friends, a little yellow bird and some wise advise from an owl he, gets out of the ice and goes to find his brother. The only help he now has is the North Star. He finds his brother but his brother doesn't want to leave the zoo. He likes it there. This shows that you can still love each other and be close even is you choose different ways of living. 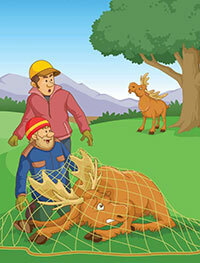 This is a fun read and it shows how inventive the brother was with his antlers. Will Alfonse decide to stay with his brother at the zoo or just visit when he can? This is a charming little story about brothers. You could easily place yourself in like situations and decide what you would do. 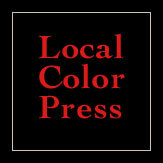 Children and adults alike will love this little book with some wise lessons to be learned. Using animals is a good way to attract and keep a child's attention.